Radio Ballad No 4 - Parker, MacColl, Seeger, etc. This recording, originally one of the ground-breaking BBC radio-ballads of the late '50s and early '60s, could have been in grave danger of being a quaint curiosity firmly rooted in that period. It is saved from this by the worthiness of its conception, the enormity of its subject and the meticulous research and production by MacColl, Parker et al. Although most of the songs are impressively crafted (despite track 4, "Now don't be late...", sounding like a reject from a Lionel Bart musical called, possibly, 'Colliers!') it is very obvious that 'crafted' is the operative word: "I'm the son of the son of the son of a miner's son, go down." With only a vague and possibly erroneous recollection of hearing a version of the song Go Down in some dim and distant folk club, I can't imagine the other songs being absorbed into the living tradition along with the usual blurring of authorship which attends the process. 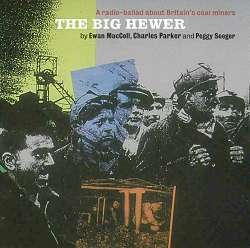 However, the real strength in this project lies in the 'actualities', as Parker called them, the documentary recordings of miners and their wives, which provide the continuous thread of dramatic narrative around which the songs are woven (that's dramatic in the sense of awe-inspiring rather than theatrical). "He was killed in the pit. He was killed on a Friday morning. On a Good Friday morning. I shall always remember. A stone fell on him. And they brought him home. I shall always remember. He was killed in the pit." - from an unnamed miner's widow. There is an exquisite simplicity and poetic nobility contained in the natural speech which is never quite equalled by the song lyrics. One cannot quibble with the small (and few) deficiencies in this production, it was after all a radical and inspirational form of documentary of almost forty years ago. Neither can it be filed under 'folk nostalgia'. What has been documented is not a ephemeral snapshot of '60s folk music, it is a more enduring social history - real, hands-on, everyday yet exceptional people history - therein lies its potency.